Take the comfort of an indoor bed with you when you sleep outside on the Coleman Airbed Cot. Just connect the included 4D pump to the Double Lock valve for easy, leak-free inflation. Once you find the perfect firmness, the AirTight system will help keep it there, since it's factory-tested to be leak-free. The ComfortStrong coil system provides all-night support. It is more than a place to sleep with a side table with cup holder to easily place your drink, a snack, a magazine or personal items. 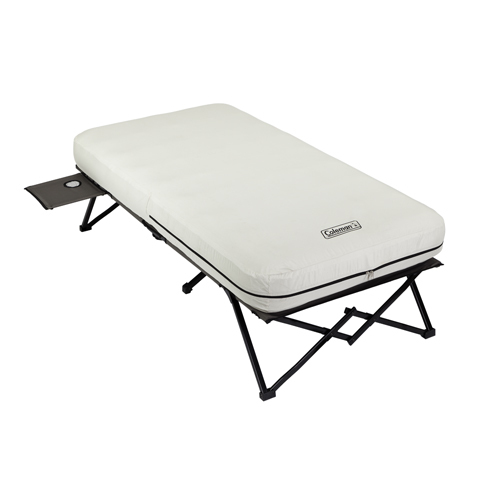 A sewn-in cover keeps the airbed in place on the strong steel frame. When you're ready to pack up, the Double Lock valve lets you deflate the bed just as easily, and it folds up into a carry bag for easy transport and storage. - Dimensions: 74" x 40" x 23.5"